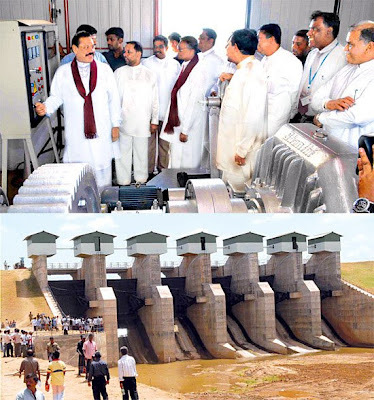 President Mahinda Rajapaksa releasing the first waters of the Weheragala reservoir (built using 100 percent local talent) on Saturday, emphasized that the country’s future development thrust would be built on the pillars of indigenous know-how, expertise and resources. The President held up Weheragala as ample testimony to the existing local talent, expertise and resources and identified the effort as being reminiscent with the renowned engineering marvels of the country’s historical past. The reservoir commissioned by the President on Saturday was constructed using the technological know-how of local expertise with a support local work force of around 1,000. The Weheragala reservoir has been set up by building a dam across Manik Ganga to store water which flows into the sea without being used for a fruitful purpose. The dam is set up in the Yala National Park on the Buttala - Kataragama road and the water of Menik Ganga will be taken 23 kilometers away to Lunugamvehera through a channel. The reservoir will release 8.5 cubic metres of water per second through its southern sluice-gate additionally providing 60 million cubic metres of water to the Kirindi- Oya project annually. This move will benefit around 6,000 families who are dependent on the Kirindi- Oya waters. The Weheragala Reservoir Project will provide water to cultivate 25,000 acres of paddy in both Yala and Maha seasons for farmers in Kataragama, Tissamaharama, Lunug-amwehera and adjoining areas. Waters released is expected to help in alleviating the scarcity of drinking water especially in the sacred city of Kataragama. President Rajapaksa noted that he was not only impressed with the local talent and expertise when building the reservoir but also was very impressed by their commitment. He said it was brought to his notice by the military chief of the area some time back, an incident which took place involving the chief engineer of the project, at a time when the area was constantly under threat due to terrorist activities, which portrayed his commitment to the cause. According to the President, when the area military chief had visited the engineers’ lodgings, his sub-ordinates had informed the officer that their leader had gone missing. Fearing the worst, the military officer with his men had gone in search of the engineer in the rain. Finally he had found the engineer near one of the spill gates of the reservoir trying to drag out a fallen log single handedly in the rain which was blocking the gate. Citing this selfless act as one which portrayed the commitment by the whole of the local staff in building the re4reservoir under adverse conditions, the President said: “All politicians and state workers who are paid servants of the public should display such commitment in serving the masses and taking the country forward”. The President also claimed that such commitment coupled with the vision of the present Government would pave way for equity in development. “I would ensure that equal opportunities and facilities are enjoyed by all Sri Lankans irrespective of where they live. Terms such as border and underdeveloped villages would not exist in the Sri Lankan map in the future,” he added. Ports, Aviation, Irrigation and Water Management Minister Chamal Rajapaksa addressing the gathering said that Weheragala was languishing behind where there was an acute need for an alternative water supply route to Lunugamwehera after the project failed to store expected water levels at it’s inception in 1980. He said farmers of Weerawila, Debarawewa, Thanamalwila and Pannegamuwa will be able to cultivate both Yala and Maha seasons with the project coming into being. There is an acute shortage of drinking water during the Kataragama pilgrimage season. The reservoir project will be a solution for that, he added. He added that another mega irrigation project-Uma Oya, which is in its planning stage would be completed within four years and this would help alleviate water related problems experienced in all the Grama Sevaka divisions in Wellawaya. Saturday’s commissioning ceremony was witnessed by more than 5,000 local farmers of the area who braved the scorching heat and rugged terrain to witness the historic occasion. The ceremony was also attended by the Maha Sangha. Mass Media and Information Minister Anura Priyadharshana Yapa, Construction and Engineering Services Minister Rajitha Senarathna, Nation Building Minister Jagath Pushpakumara, Ministers Jayatissa Ranaweera, Mahinda Amaraweera, Geethanjana Gunawardana, Basnayake Nilame of Ruhunu-Kataragama Maha Devalaya and leader of the UPFA team for Uva Province Sashindra Rajapaksa, Irrigation officials and others attended the ceremony.